Choosing a new dentist can be a daunting task. Whether your old dentist disappointed you, you just moved to a new area, or it has been years since you’ve given serious attention to your oral health, you might not have any idea how to start your search. Fortunately, you are not without help. Here are a few traits you should focus on when you’re trying to find an oral healthcare professional who is a good fit for you and your family. All dentists must undergo the same basic education in dental school, but that doesn’t mean they’re all equally qualified to give your smile the excellent care it deserves. Look for a dentist who has participated in additional training via prestigious programs. You should also consider their years of experience and whether they use up-to-date technology in their office. It’s easy to find a dentist who offers basic preventive care, but what if you require more than basic services? A dentist’s website often has detailed information about the procedures they’re qualified to perform. Whether you’re looking for someone who offers TMJ therapy, cosmetic treatments, or periodontal therapy, be sure that any dentist you’re considering is able to address your unique needs. You can learn a lot about a dentist from the reviews that other patients have posted online. 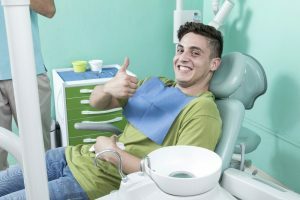 For example, you can learn about the dentist’s chairside manner, the cleanliness of the office, and how the staff members interact with patients. You can also discover whether people were satisfied with the quality of the dental work and whether they felt comfortable in the office. Reviews might even call your attention to things that you didn’t even know you wanted in a dentist. You want to feel welcome in your dentist’s office, not just like you’re another item they have to check off their to-do list. If you visit a practice and feel that the dentist and the staff members see you as an individual and truly want to establish a lasting relationship with you and your family, that’s a good sign that you’ve found a keeper. Money isn’t the most important thing to consider when you’re choosing a dentist, but it is something you need to think about. Is a dentist willing to work with your insurance plan? Will they help you apply for financing for major treatments? Is there an in-house savings plan that can help you get the care you need at an affordable rate? Finding out the answers to such questions can prepare you to take care of the financial aspect of maintaining a healthy smile. Dr. Erick Anderson and the rest of our team are committed to providing unparalleled dental care to families in Colorado Springs. Dr. Anderson has undergone advanced training at the Misch International Implant Institute and the Dawson Center for Advanced Dental Study. He offers a broad range of services and is focused on establishing one-on-one relationships with patients. Our practice consistently earns five-star reviews from our patients! To learn more about Dr. Anderson and discover why he may be a perfect fit for you and your family, contact our office at 719-593-0988.